KE00057 is a solid phase sandwich Enzyme Linked-Immuno-Sorbent Assay (Sandwich ELISA). 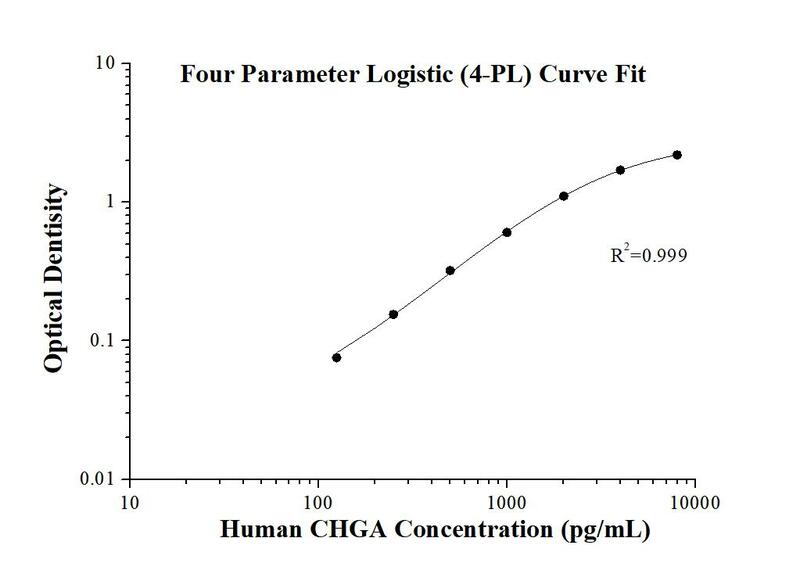 The CHGA ELISA kit is to be used to detect and quantify protein levels of endogenous CHGA. The assay recognizes human CHGA. A polyclonal antibody specific for CHGA has been pre-coated onto the microwells. The CHGA protein in samples is captured by the coated antibody after incubation. Following extensive washing, a monoclonal antibody specific for CHGA is added to detect the captured CHGA protein. For signal development, horseradish peroxidase (HRP)-conjugated antibody is added, followed by Tetramethyl-benzidine (TMB) reagent. Solution containing sulfuric acid is used to stop color development and the color intensity which is proportional to the quantity of bound protein is measurable at 450nm with the correction wavelength set at 630 nm. Chromogranin A is a member of the granin family of neuroendocrine secretory proteins. It is located in secretory vesicles of neurons and endocrine cells. Chromogranin A is the precursor to several functional peptides including vasostatin, pancreastatin, catestatin and parastatin. These peptides negatively modulate the neuroendocrine function of the releasing cell (autocrine) or nearby cells (paracrine). CgA is one of the most used tumor markers in NET's (neuroendocrine tumors) , and elevated CgA concentrations have been demonstrated in serum or plasma of patients with different types of these tumors. However, CgA is not a tumor-specific antigen for NETs, and an abnormal concentration has been described in some non-malignant diseases such as renal failure, heart failure, proton pump inhibition, gastritis, hypertension, or patients with liver diseases.